Are you going on a special trip or journey? Planning for a retreat or immersion? 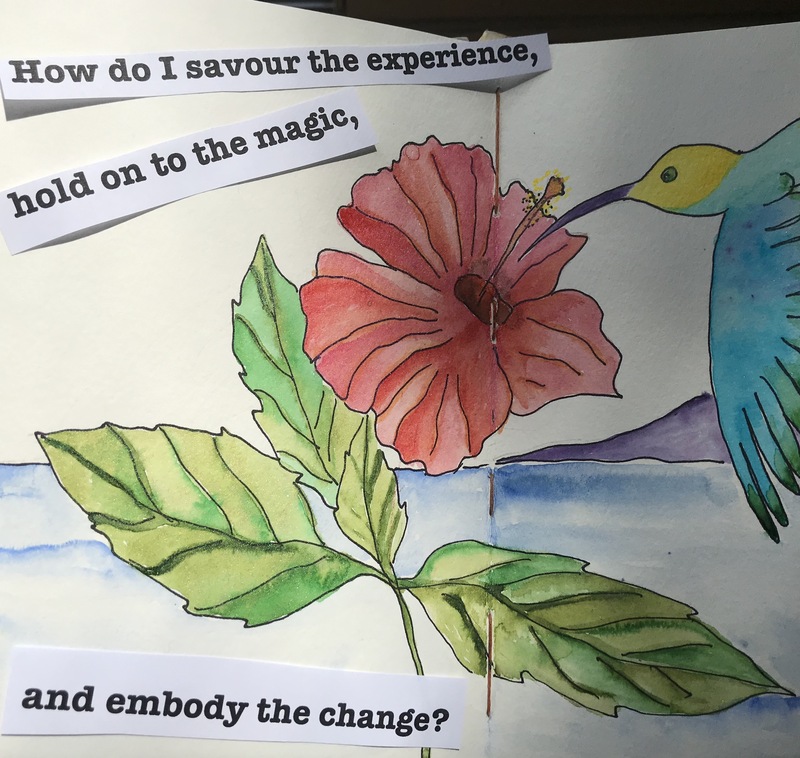 How do you savour the experience, hold on to the magic, and embody the changes you make? How do you take this experience back into your daily life, and both protect and share the benefits? Terry and Julia share their answer – creative journals! When we invest our resources – time, money, creative energy – into a very special experience that takes us from the rhythm of our daily life and immerses us in a carefully held and crafted space, we remember ourselves at a deep level. We come away feeling “changed”. We want to savor that change and hold on to our re-vitalized self. We want to both protect and share the good energy and the deep learning, and allow it to flow into our own lives and the lives of others – family, loved ones, clients, students. When we travel, to new landscapes or cultures, or sacred experiences, we re-c0nnect with what is most important to us. When we gather in circles with others to create, explore, get quiet, listen deeply, we are changed. Setting aside sacred time and space to creatively encounter the most important questions re-awakens our purpose and unique gifts. In order to live lives of integrity and meaning, It is essential to draw on our deepest source of wisdom and share that in the world. This is how change happens, and how it grows. We recently had the opportunity to meet with Terry and Julia, who participated in our Hollyhock workshop last summer. We are so inspired by their creative journals, that we asked them to share, so that others may benefit as well. 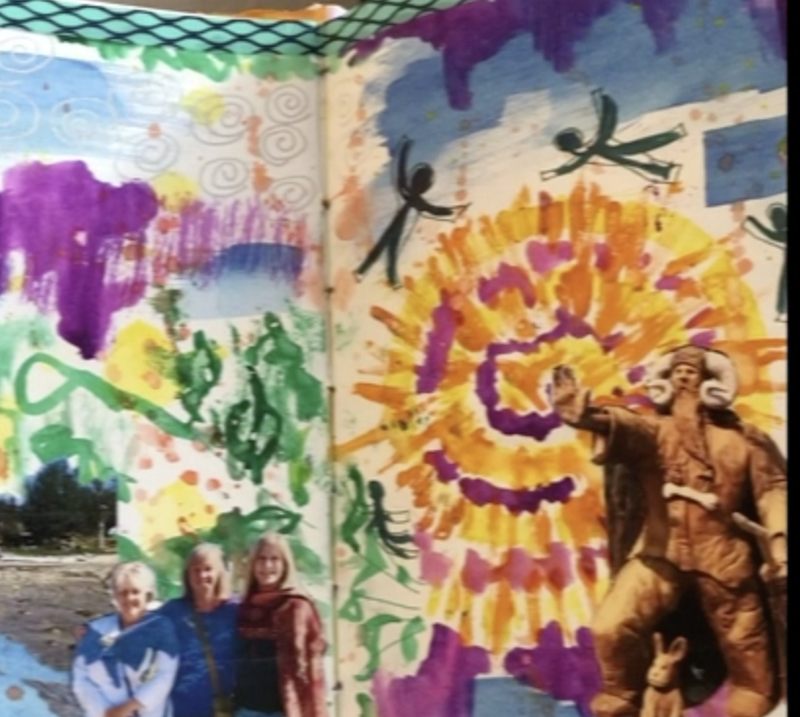 Terry and Julia have each been creating their “Hollyhock journals” over the past 7 months, since returning from last year’s expressive arts immersion. Using photographs, art, and creative writing, they have re-created that sacred space in tangible form, allowing them to revisit, to share, and to harvest the benefits. Watch, and listen…. When you witness Terry’s and Julia’s journals, do you sense their love, care, and dedication? ? Their investment in their own growth and change is clear. They are each continuing to work in these journals over time, as they harvest the deep learning into their lives. 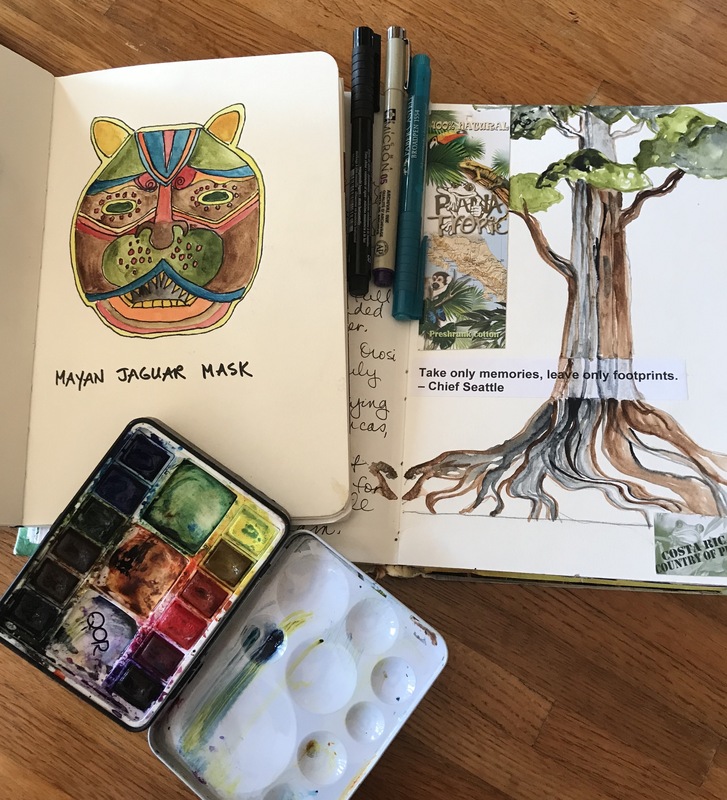 Their journals are creative artifacts that allow them to keep alive the threads of deep inquiry that happened at the Hollyhock workshop last year. Are you coming to Hollyhock or going on a special journey or creative immersion? Set an intention to listen deeply to your experience – both outer and inner – and to reflect on and record it. Buy (or make) a journal to take along. Choose something that attracts you – consider size, type of paper, binding, cover, color. Pack a small pouch of your very favorite supplies – writing pens, tiny set of paints or colored pencils, small scissors, glue stick. Be a witness to your own experience. Notice what is happening within you, and track that in whatever way(s) work for you. Take photos. Gather materials from your journey. Return to , and continue to work in your journal. Review and reflect your experiences. You might print your photos and integrate them in to your journal, as Terry and Julia did. How am I carrying this experience forward in my life? What is one lesson I learned that I will always remember? How does this experience change the way I show up in the world? This year, we will be facilitating The Landscape of Expressive Arts at Hollyhock, May 31 to June 5. 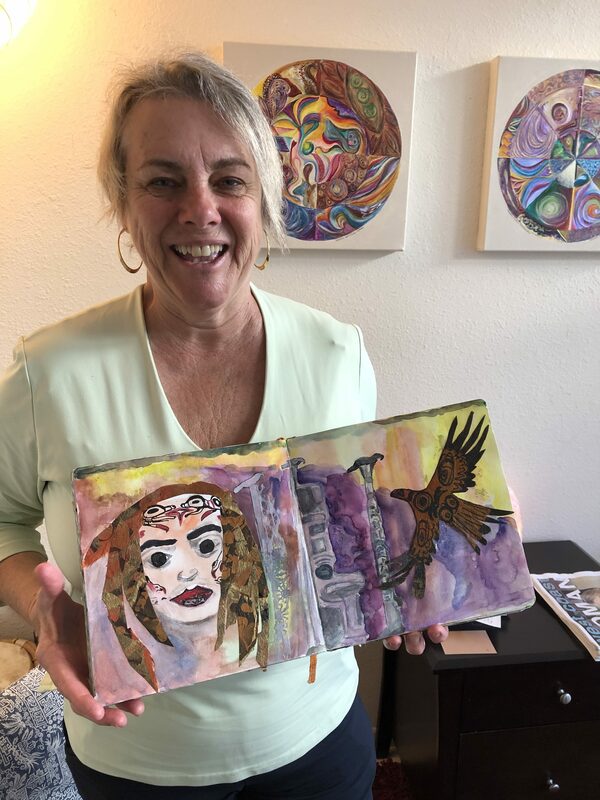 “My participation in the 2018 Dive into Expressive Arts workshop continues to inform my journey. I truly believe in the healing, transformative and connective powers of this work. Making the video was a welcome opportunity to continue to reflect, process and distill the Hollyhock adventure and connections. It keeps on giving!- Julia A. A beginning is an opening for surprises. Beginnings are new horizons that want to be seen. What is the new horizon in you that wants to be seen? The New Year is an opportunity to set a new course for ourselves. Emerging from the darkness of the Solstice, the change of the calendar invites change in ourselves. RESOLUTION Have you made New Year’s resolutions? I think most of us have. Did you succeed in meeting them? The dictionary tells us that “resolution” is a determination to do something or not do something”. My own track record with these beginning-of the-year resolutions to ‘do better’ in some way has usually been to abandon them early on. At some point I would do something that I had resolved not to, or not do something that I had resolved to do, and that would likely mean the end of my resolution. I might give it another try or two, but I can’t think of any time where I experienced more success than failure. For me the energy of the word “resolution” is one of gritting my teeth, exerting my will power, and holding, or contraction. A resolution seems to come from a place of needing to fix something. This kind of energy, I find, rarely serves me well. INTENTION What about the word “Intention”? A quick dictionary search brings up: “An aim that guides action”. “Intention”, for me, carries a different kind of energy than “resolution”. It feels like an expansion, rather than a contraction. Intention isn’t about not-doing, and in some ways, not even about doing. It is about getting clear, discerning, paying attention to what is trying to emerge deep within, and planting that in the world. It is positive. It is more about actualization, and less about limitation. I discover my deepest intention by allowing myself to enter the mystery of darkness, to mine my imagination, to allow my imagery to arise, revealing to me the gifts of my creative wisdom. Resolution is about forcing. Intention is about discovering, clarifying, honing, and allowing, and guiding. Resolution comes from the outside. Intention comes from the inside. There is an instinct for newness, for renewal, for a liberation of creative power. We seek to awaken in ourselves a force which really changes lives from within. I extend a gentle and spacious compassion, to myself and others, equally. Intention implies trust. In the flow of our lives, there is a deeper knowing than we are aware of consciously. Even when external circumstances seem to be pointing us in one direction, or when we are mired in confusion or uncertainty, there is always a deep river of knowing moving beneath the surface. How do we access that river? I get there through dreams, through the body, and through the arts. The most reliable way for me to discover and connect with what is going on at a deeper level is to spend a few minutes in meditation, and then to make a visual image, explore that image in my body, and write from the voice of the image. Sometimes, I also use sound or rhythm exploration as part of this. What is revealed is what I have come to call my creative wisdom. If you haven’t tried this, I invite you to. journal prompts and ideas for keeping your intention alive. 2. Our live-in-the-studio Intention Setting event. Coming up this year on January 30. 3. This simple practice to get you started. 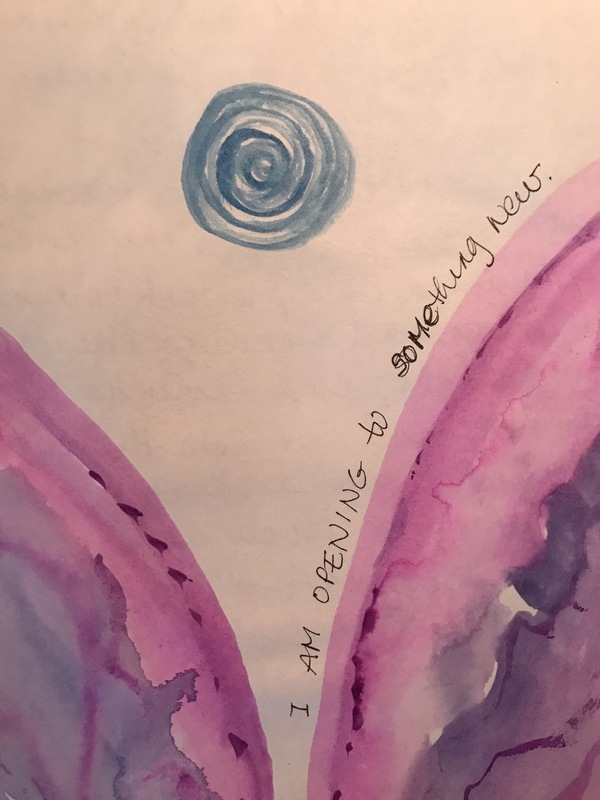 What newness is arising for you this year? Sit quietly, focus on your breath, and contemplate the terrain of your life as you move into the New Year. What newness is coming into form, and how can I help it along? Create a visual image and a writing in response. Revisit it throughout the year. For witnessing and support, post in our FB group. Let’s cultivate our creative intentions together! Look deep into nature, and you will understand everything better. What is it about a natural, pristine setting, that makes a perfect venue for entering into the deep exploratory creative space of Expressive Arts? As I sit, now, experiencing the shoreline, the cedar trees, the sparkling water and soft breeze, tuned in to all my senses, a single word arrives: Spacious. For me, to explore myself creatively, I need and want some space. What that means is the freedom to attend to myself, witness my own shifting moods and emotions, attend to the needs of my body, notice my inhale and exhale. I may move more slowly, attuning myself to my own rhythm. I may rest more, take more walks and swims, pay attention to the moon, stars, and tides, and remember my dreams. I am likely to eat locally grown food, and stop on the road or path to have actual conversations with people in the course of my day. Another word arrives. Held. This word speaks of containment. It means soft, loving, yet firm boundaries around me, positioning me in a place where I really am free to explore. A container that doesn’t constrict me in any way, yet gently holds me so that I know I am safe, cared for, and valued. A container that I can trust, appreciate, and not have to think about. A container I can count on, as a gentle, loving, unobtrusive presence. A container within which I feel free. Spacious containment. The natural world holds me, offers me an intimate remembering of rhythms – cycle of the days, of the moon, of the tides, the seasons. By being with those rhythms, I feel the echo of them deep within me, attuning me to myself. Not the self I think I should be, but the self I am, in this moment. The natural world bathes me in expansiveness, vastness, possibility. When I am in this spacious state, I am aware of, in tune with my own creativity. The images of the outside, literal world echo and resonate within me, bringing forth images of the imaginal world, sometimes surprising me as they show up on paper on canvas. I do not tune out the sounds of my environment – I invite them in to become a part of my ever evolving inner landscape. 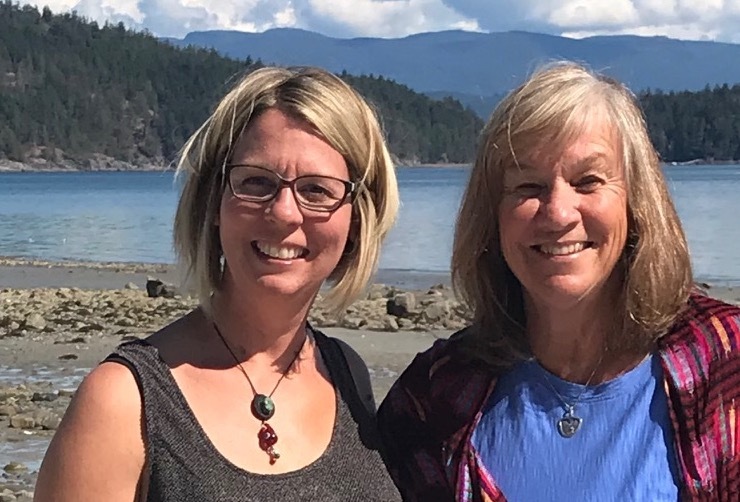 Cortes Island, in its wild, natural beauty, opens me up to my own creative possibilities and attunes me the natural cycles of the earth, and of myself. On August 29-September 2, Tamara Teeter Knapp and I will guide a creative immersion workshop here on Cortes, at Hollyhock. I cannot imagine a more perfect container for a dive in to Expressive Arts. Hollyhock is operated and managed in harmony with the land and sea that it is built on. When you come to Hollyhock, you are held – gently and beautifully. The setting of forest and sea, the accommodations, the staff, the magnificent garden and the exquisite food – ah! – this is a place where you can fully experience the spaciousness and expansiveness of nature, while knowing there is a wonderfully crafted container that holds and supports you in your inner journey. Or, maybe you will be inspired to find yourself somewhere, in a beautiful, natural spot – a place where you can experience spaciousness. A place where you are held in beauty. Your creativity will flourish and you will be renewed. More about our workshop here. Want an introduction to Hollyhock? Watch the Welcome Video below! In the middle of a busy day, Tamara goes to her expressive arts practice to check in and re-center. What does it take? Five minutes of time, a little space to move, a paper taped to the wall and a box of crayons. You don’t have to be a dancer, or an artist. You can find your own practice, in your own way, and within your capabilities. Pause, and listen within. Your body holds the wisdom. Colors and marks on the paper make it visible. Words come spontaneously, bringing a message. Breathe. Exhale. You can do this. A short creative pause can change your day. Are you ready for a brief introduction or a deep immersion? Join us live and online for our next Expressive Arts Discovery Virtual Workshop. 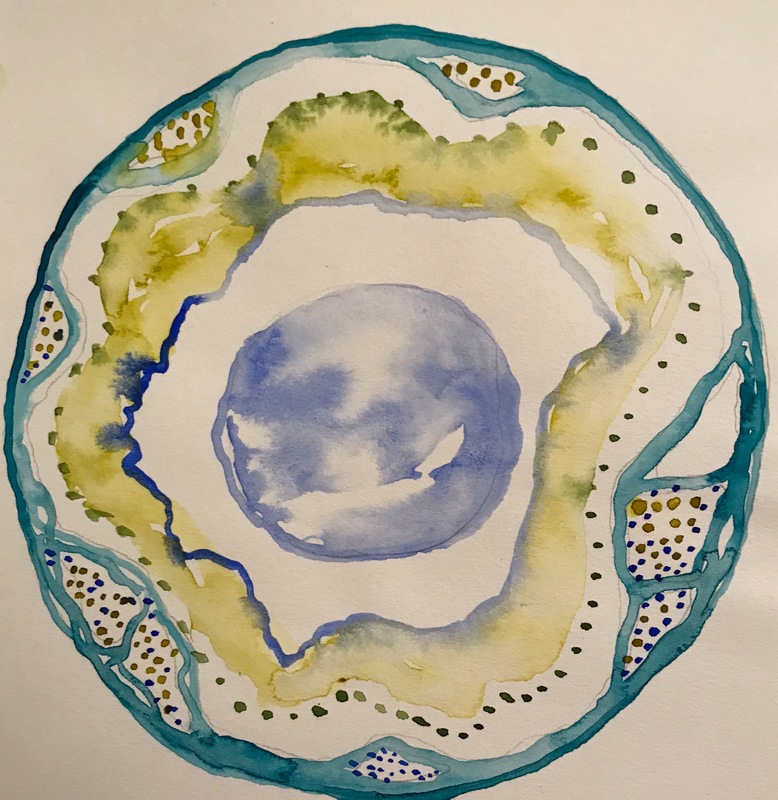 Dive In to Expressive Arts at Hollyhock August 29-September 2. Watch a longer video of Tamara’s movement practice here.